Royal Caribbean’s Allure of the Seas has so many dining options, you almost don’t know what to do with yourself while you’re there. Honestly, the endless amount of free food had me worried about being away on this trip. Here I was literally hitting the gym every day and eating right 80% of the time before the trip only to be thrown in the middle of the ocean with seemingly infinite food. Yeah, you’re probably thinking, “just say no.” But, put food in front of me and I have to eat it. So, in addition to all of the crazy stories I have from the trip, I have lots to talk about in regards to the food on the ship. I have to split all of this stuff up to give myself some time to document it. 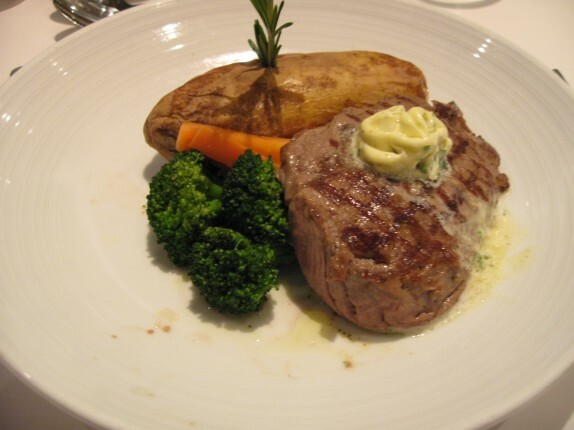 This installment covers just the food I had when dining in the main dining room, Adagio. The way a cruise normally works is that you get an assigned table and time to have dinner in the dining room. It’s set up to appear like a fine restaurant. 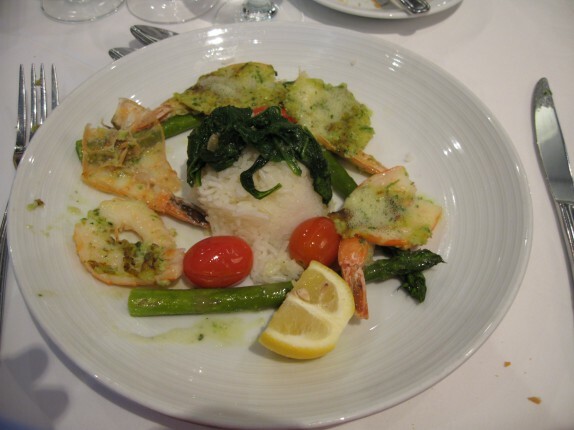 You have a head waiter and regular waiters assigned to your table. The menu is prix fixe and usually changes every night. On the Allure of the Seas, there was a handful of items that would be available every day in addition to the rotating menu. What people don’t realize before they go to these cruises is that you can order as many things as you want and it doesn’t cost you anything more. Unless, of course, you order alcohol; then, you’re on your own. So the first night we were on the ship, we decided to eat in the main dining room. It actually wasn’t totally great. 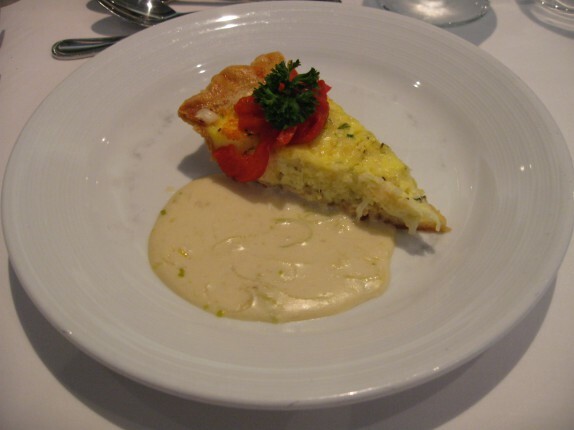 The appetizer I started with was a quiche, served with a cheese sauce on the side. It wasn’t anything special, and didn’t bode well for the rest of the meal. My first main course was a NY strip steak. I was dumbfounded. 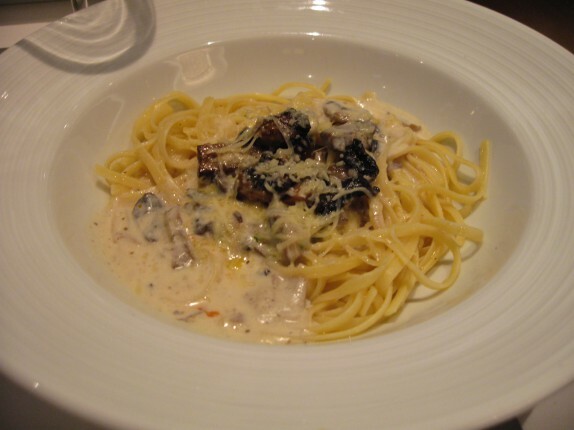 Another main dish featured that day was fettucini alfredo with mushrooms. I had to see the pasta situation. The sauce was broken (you can see the beads of butter rising to the top in the lower left), and, furthermore, the pasta wasn’t even tossed completely in the sauce! To be fair, this had very good flavor, but I never overdo the pasta. 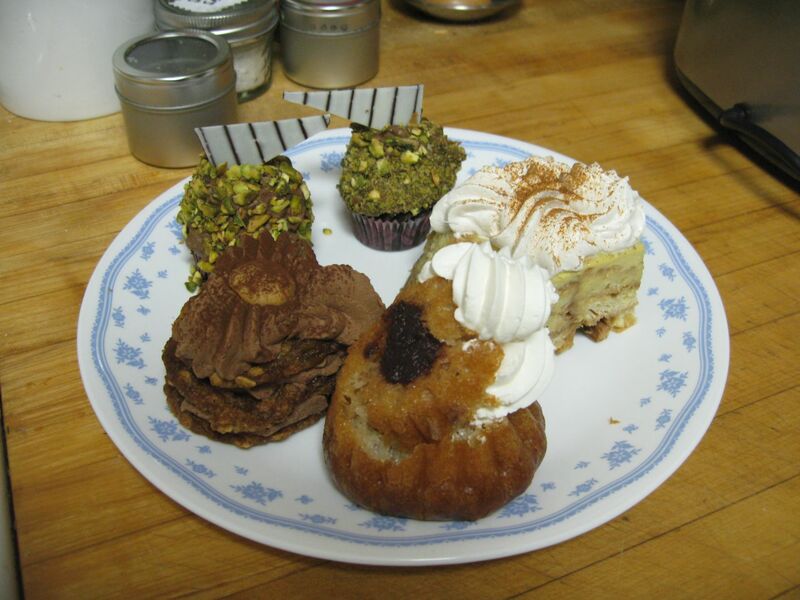 I do, however, overdo dessert. 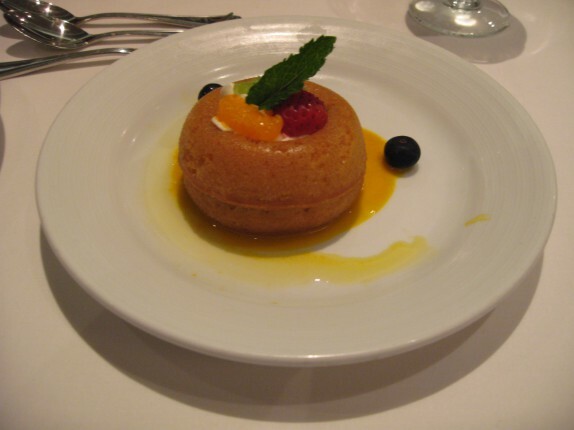 They had savarin, a rum cake injected with pastry cream; it was served with a peach puree. I also had to check out the chocolate cake they were pushing that night. It was served with the most delicious cherries. I don’t think this was as great as the savarin, but it was definitely enjoyable. We took a couple of nights off from the dining room and explored some other things that’ll be included in other posts, but, when we did go back to the Adagio, I sought to redeem the experience of the first night. Actually, when the food started coming out, I realized I ordered wrong. Cassie got a scallop risotto, and it looked great! 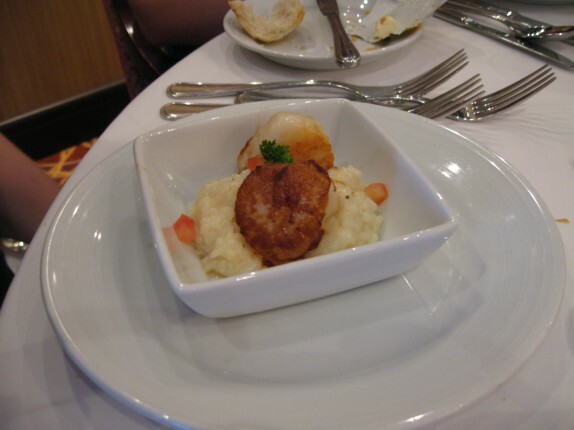 Well, the scallops looked great; the risotto looked like rice. 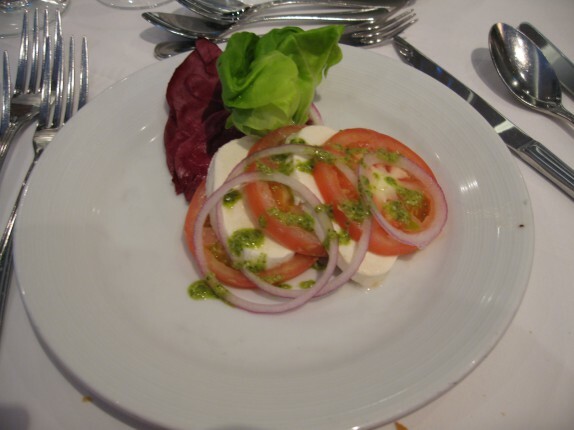 Hey, it looked tons better than the mozzarella and tomato salad I ordered. 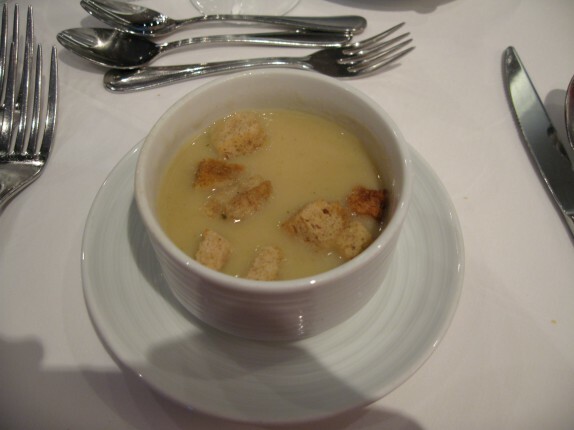 So I additionally ordered the soup (which I never do), which I think was a roasted garlic soup served with croutons. They were batting 0 for two that night, so I was hoping the main dishes would captivate my senses. And they did. The first one, garlic tiger shrimp, was extremely tasty, but just wasn’t substantial. This one was fun because the waiter had to demonstrate how they intended for you to deconstruct the dish. I would liken this to an oreganata, like when you sprinkle clams with garlic, parsley, bread crumbs, and butter, but with butterflied shrimp. It was excellent, but paled in comparison to what came next. While not totally visually appealing, this dish was utter brilliance. It was kaju paneer dhansak, a pineapple, cheese, and lentil Indian stew. It was spicy and intense in flavor and fragrance. I almost ordered a second portion, but I seem to recall being full from something earlier in the day (it’s escaping me now). The naan bread served on the side was cute but kind of sad, and the rice was fluffy, fragrant, and delicious. Pappadum are always fun. And the meal kept getting better. 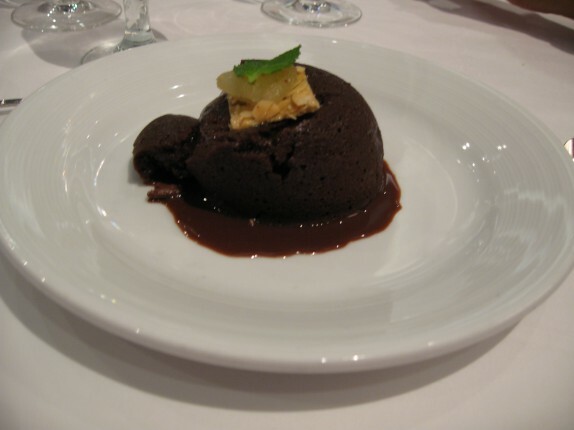 They brought out a warm chocolate cake that was really rich and tasty. But then they totally floored me. 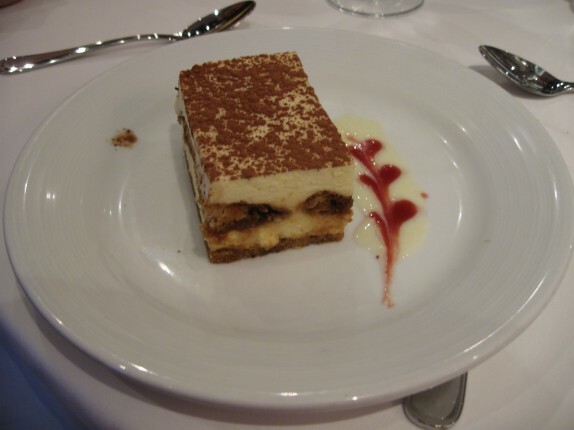 With a little dish called tiramisu. I like to think I know a lot about this dish. I’ve been told I make very good tiramisu; I’ve spent years making it on a personal level and on a professional level (for a while, in my dad’s shop, I was the only one allowed to do it.). Anyway, the tiramisu on the ship was incredible. The first thing I look for in a portion of tiramisu is a gradient of coffee soaked into the cookies. If you leave them in the coffee/liquor too long, they turn to mush and leave no texture to grab on to. Here, the center of the cookies barely had any liquid. They do the usual industry shortcut of using cake on the bottom layer, but I was able to let that go for what was in the middle and the delicious cream, which clearly contained no actual heavy cream (a pet peeve). 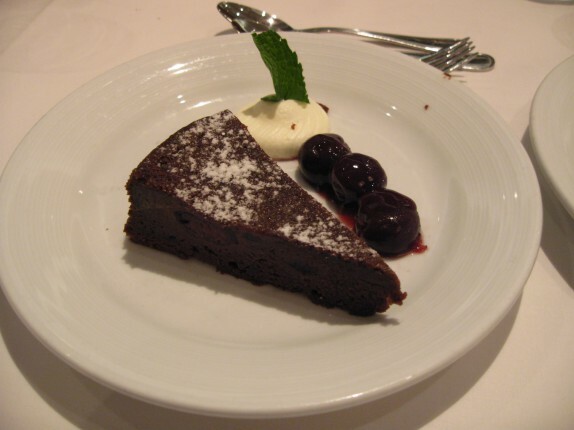 Also, the topping was nice and bitter chocolate, which helps to balance some of the sweet and creamy textures in it. I loved this so much. Again, we did some other things for dinner for a couple of nights, and then we went back to Adagio for the final dinner. 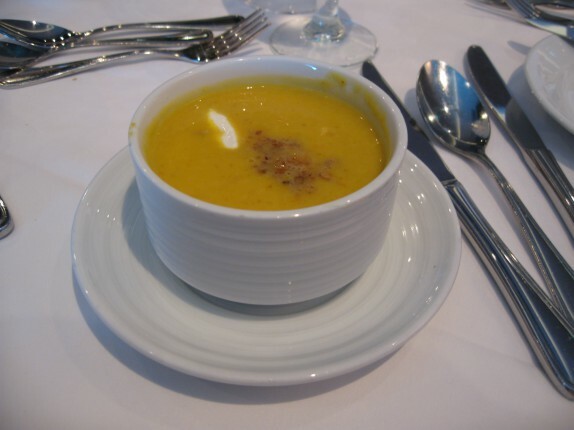 I started with a pumpkin puree soup. One bite of this was enough to know it wasn’t for me. I kind of learned my lesson with the pasta from the first night, but, I saw gnocchi on the menu this night, and I had partook in a fabulous chef’s dinner (which was an additional cost and something worthy of its own post), so I wanted to see how they’d do gnocchi. Unfortunately, they were not homemade, which is always a bummer to me because gnocchi are so easy to make [maybe not so much on this scale]. Ohh well. 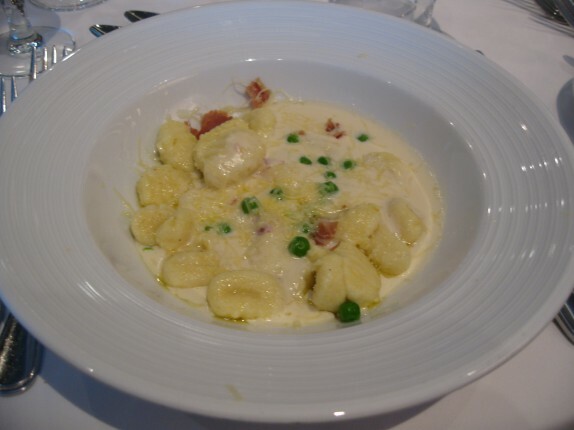 The gnocchi were tossed in a cream sauce and proscuitto and peas. It wasn’t horrible; it was just very heavy and cumbersome. 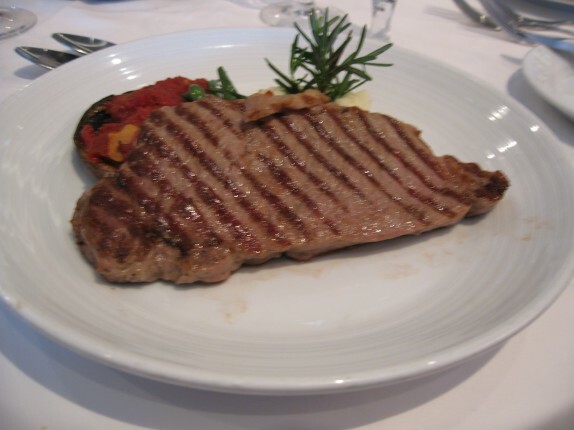 I went back to the well with the steak too; this evening, they had a sirloin steak, which I assumed would be a little larger than the NY strip. It was pretty much a repeat of the first steak, so, after a no-thank-you bite, I ordered the Indian dish of the evening, paneer makhani, which is cheese simmered in a fragrant cream sauce. Again, this dish was incredible. 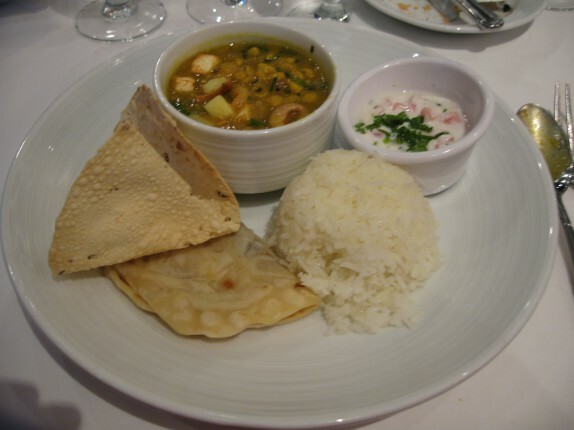 Because the Indian dishes were so reliable, I was positive that the Indian influence in the kitchen was strong. I’ll never know for sure, but I definitely give that kitchen props for making such great Indian dishes. 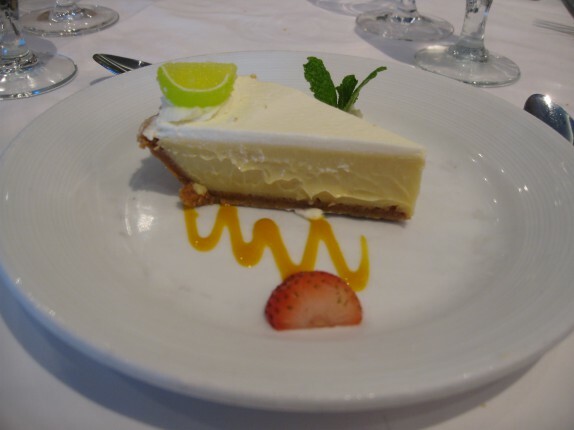 For dessert that night, I had the key lime pie, which is apparently a common final dinner service dessert. I don’t have anything bad or great to say about this. It was good, just what you’d expect. They set their standards pretty high in this dining room, so I was sure to keep mine at a high level as well. If something wasn’t great, I didn’t have the whole thing; I was also vocal with the server about things being not great. Even if there was nothing he was going to do, at least the input was made. I was complimentary in the cases where I was impressed. The server seemed to love my feedback. The kitchen is cooking dozens of different dishes for thousands of people at a time, so I understand that getting all of these meals out and executing each of them properly is a grand task. The highs were high, and the lows were low. Now that I’m off the ship, I totally understand the strengths and weaknesses; having the data helps. But this really was a tip of the iceberg (inappropriate pun? ), so to speak, as far as the meals went. The ship was loaded with other free options, and other premium options that we took advantage of. 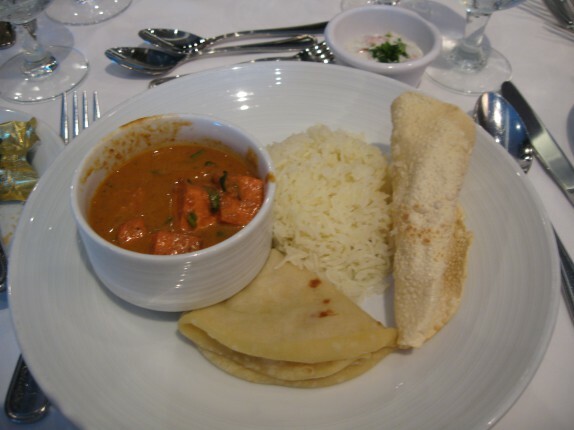 i have to wonder what your indian dining companions on the ship would say about the indian food. looks good to me but what do i know? at any rate an all you can eat dinner each night sounds fab.